This is the title of a Midnight Matinee in aid of the Campaign which will be held at the Royal Festival Hall shortly after the ending of Nuclear Disarmament Week, on Monday, 21 st September, at 11 p.m. The Matinee is being organised by the Women's Group of the Campaign, with the help of J. B. Priestley. The programme will include stars of stage, screen and radio Dame Peggy Ashcroft, Jill Balcon, Constance Cummings, Cecil Day-Lewis, Gerard Hoffnung, Miles Malleson, Denis Matthews, Michael Redgrave, Dame Sybil Thorndike, Stanley Unwin and others. We hope that Groups will start right now organising coach parties and that individual supporters will bring a group of friends. Some transport home will be provided by London Transport. Tickets will be available from the Royal Festival Hall and from the Campaign Office at 143 Fleet Street, E.C.4, towards the end of the month, at £1, 15s., 10s., 7s. 6d., 5s. and boxes (five people) at £6 5s. and £3 15s. Leaflets with tear-off order forms for tickets will be available also by the end of the month, and posters. 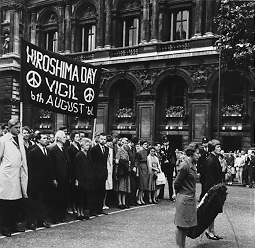 The final demonstration in London of Nuclear Disarmament Week will take place on the day before the Matinee, on Sunday, 20th September, in Trafalgar Square, at 4 p.m. It will be followed by a short march around the West End and down the Strand and Fleet Street to St. Paul's Cathedral. Bertrand Russell has agreed to be one of the speakers, weather permitting. This will be the first time he has spoken in the Square. As this will be mainly a London Demonstration (other Regions are holding their final rallies on Saturday, 19th September) we hope that all supporters in the Greater London area will make sure that the Square is packed. Leaflets and posters advertising the Rally will be ready shortly. Nuclear Disarmament Week promises to be the biggest and most widespread demonstration yet mounted by the Campaign. Hundreds of thousands of leaflets and thousands of posters are now being overprinted with local activities. Meetings will range from Cornwall to Aberdeen, from Swansea to Great Yarmouth. Here are particulars of one or two activities which arrived too late for the July Bulletin. GREENWICH: A Petition to the Prime Minister will be brought up by boat to Westminster Pier on Saturday, 12th September, for delivery to Downing Street. YORK: 'A Day of Preparation', taking the form of 24-hour watches of prayer and meditation, from 8 a.m. on Friday, 11th September, to 8 a.m. on Saturday, 12th September ,to be followed by a united Procession of Witness on the Saturday afternoon. 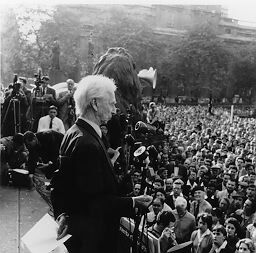 Description: Bertrand Russell addressing a rally organized by the Campaign for Nuclear Disarmament in Trafalgar Square on September 20, 1959. 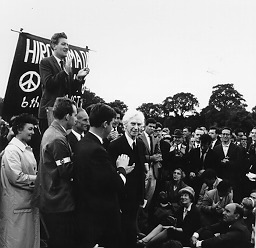 Russell had played a leading role in the establishment of this anti-nuclear pressure group early the previous year and remained its President until resigning in October 1960 over disagreements about tactics with others in the organization's leadership. Person(s) in Photograph: Bertrand Russell et al. 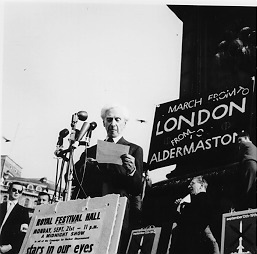 This is another photograph of Bertrand Russell speaking at an anti-nuclear demonstration organised by the Campaign for Nuclear Disarmament (CND), in Trafalgar Square on September 20th, 1959. Person(s) in Photograph: Bertrand Russell, Edith Russell, Ralph Schoenman, Rev. Michael Scott. 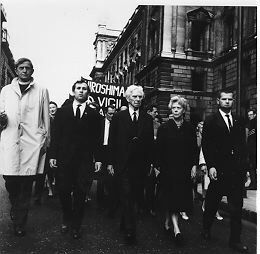 Photograph of Bertrand, Edith and Ralph Schoenman leading the Hiroshima Vigil march from the Cenotaph to Hyde Park. Person(s) in Photograph: Bertrand Russell, Edith Russell, Ralph Schoenman et al. This is a photograph of Bertrand, Edith and Ralph Schoenman at the head of the Hiroshima Vigil march from the Cenotaph to Hyde Park. This is a photograph of Bertrand Russell, Edith Russell, Ralph Schoenman et al. 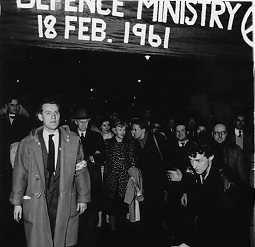 leading a march to the Ministry of Defence for a "sit-in" on February 18, 1961. 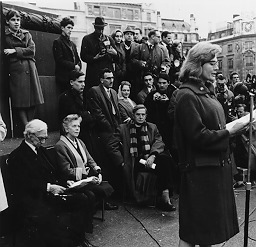 Description: Bertrand Russell and Edith Russell watching the actress Vanessa Redgrave address the Committee of 100 meeting in Trafalgar Square, which preceded the anti-Polaris "sit-in" outside the Ministry of Defence on February 18, 1961. This is a photograph of Bertrand Russell smiling after he had given his speech at the Hiroshima Vigil in Hyde Park on August 6, 1961. Russell was prevented from completing his address by police who instructed him that the use of a microphone contravened Park regulations. The meeting adjourned to Trafalgar Square. Russell's participation in the day's events led to his serving a week-long prison sentence for inciting the public to acts of civil disobedience. The Russell Archives have film footage of this too. Description: A newspaper clipping from the London Evening News on September 18, 1961 following the completion by Russell and Edith of the one-week prison sentences imposed by Bow St. magistrates. Both were originally sentenced to two months imprisonment, but these terms were commuted after the presentation of medical testimony. 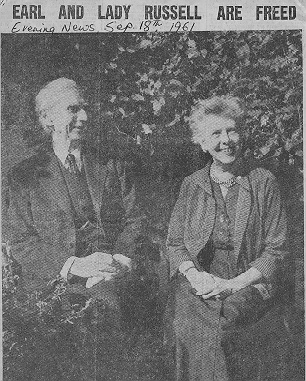 The caption says: "Earl and Lady Russell rest in the garden of their Chelsea home to-day. Lord Russell had earlier been released from Brixton Prison; his wife from Holloway." Site created and designed by Paul Barrette, 1997.